When you introduce your horse to ditches patiently and systematically, he’ll learn to approach them with confidence every time. Here, our 7-year-old homebred FR’s Commarshall, nicknamed Marshall, is cantering over the ditch with the easy, positive attitude we aim for with all our horses. Horses have a natural aversion to jumping cross-country ditches. So do riders! But that doesn’t mean teaching this skill has to be a miserable experience for everyone involved. I’ve developed a system that does it in a gentle, progressive way guaranteed to produce successful results from the very beginning. In the seven or eight years I’ve been using it, I’ve never had a horse refuse to jump the ditch in the first attempt. Before developing this system, I spent many years retraining students’ “problem” horses who routinely stopped at or were eliminated at ditches. I got on the horses and schooled them until they were jumping ditches successfully again. It was an ugly process that I didn’t enjoy—I hated feeling that I had to dominate them. And no matter how well I got them going, the problem always crept back again, sometimes within just a month’s time. I finally realized that the riders needed more education than the horses. No matter what level you are, you need to see yourself as your horse’s trainer, always aiming to inspire confidence in him—not to crush his will—so that he looks through that bridle happily. Instead of blaming him for his natural instinct to be cautious near ditches, you want to instill a new instinct in him: to trust and obey you. You have to create a relationship of faith, always thinking through the best ways to communicate with your horse without relying on your trainer to get on and “fix” him. To do that with ditches, you first have to break the lesson down into easy, understandable steps. 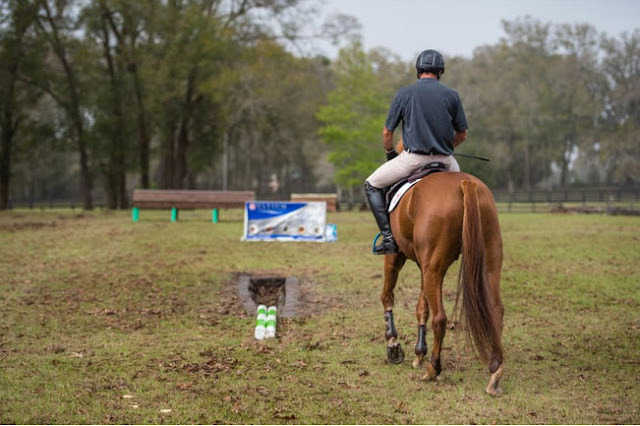 Second, you have to give your horse the exact same ride every time you approach a ditch, whether it’s a 2-foot-wide Novice ditch or a 9-foot ditch at the Kentucky Three-Day Event. The worst thing you can do is try to trick him by approaching the ditch as fast as possible with the hope that he won’t notice the ditch until it’s too late. That might work once or twice, but it won’t continue working as you progress up the levels (believe me, there’s no way to sneak up on the Kentucky Three-Day ditch). More importantly, it will destroy your horse’s trust in you. 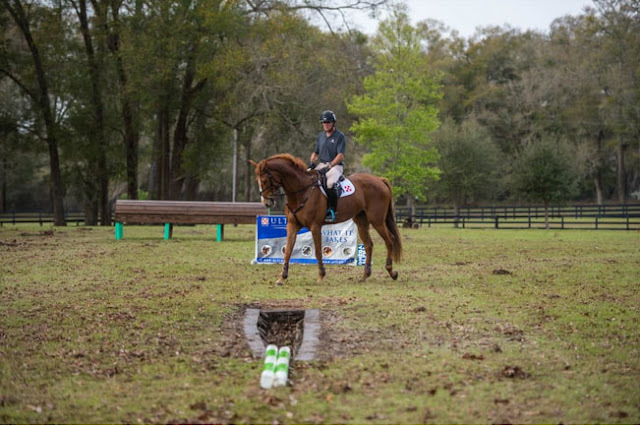 The following step-by-step system will build those critical communication skills, whether you’re introducing a green horse to ditches or retraining an experienced horse after a setback. In most cases, you can progress through all the steps in a single session. Don’t rush! If you can only accomplish some of the steps in a reasonable amount of time (20 or 30 minutes—but don’t put a clock on it), call it a day and finish the steps in your next session. Don’t expect your horse to learn how to jump ditches overnight. Depending on his comfort level, it may take five or more training sessions for him to master the concept. After that, he’ll need periodic refreshers multiple times per year. As he goes up through the levels, you will modify his schooling sessions to introduce him to each new variation of ditch challenge he’ll face in competition. 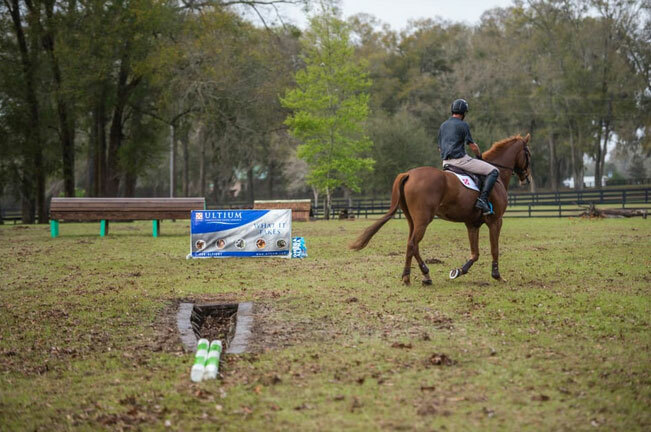 If you don’t have easy access to a ditch that fits the guidelines I describe in this article, research local cross-country courses and event barns that have schooling ditches available. Even if you have to trailer a substantial distance and pay a full day’s fee to school just the ditch (and a few warm-up jumps), it will be worth it. The jump poles are essential, too, so if the venue doesn’t have any available, bring them along in your truck or trailer. You may find that you’ll save money and time in the long run by digging your own ditch at home. I dug the one you see in these photos by hand. Just be sure that the ground on either side of the ditch is settled and stable before you use it. Place two colorful 12-foot show-jump poles parallel and next to one another in the open space beside the end of the ditch. The most important prerequisite for this training system is having a horse who comes off the leg willingly. That means he lengthens his stride obediently when you close your legs on his sides. To be truly effective, you should be able to lengthen and shorten his stride in any gait by about 30 percent. He also needs to be comfortable walking in the open on a soft rein. If he jigs frequently or otherwise shows signs of nervousness, get to the bottom of that before tackling this system. The ideal ditch for this system has a defined edge on both sides—usually revetted with railroad ties or telephone poles. It cannot have wings and should be no wider than about 1½ feet. The surrounding ground should be flat with plenty of open space on one or both ends of the ditch where you can maneuver. The ditch I use is about 20 feet long. It narrows from about 2 feet wide on one end to about 6 inches on the other. You’ll also need two colorful 12-foot show-jump poles, ideally with stripes that can help you aim for their centers, plus a traffic cone, ground pole or some other easy-to-move visual marker. Finally, as with all jump schooling, having a ground person is crucial. He or she will not only adjust the poles but give valuable feedback on your ride. Warm up your horse far enough away from the ditch to prevent it from being a distraction. Pay special attention to his rideability, asking him to shorten and lengthen his stride in all three gaits. Be very clear with your aids and insist that he respond promptly every time. When he is moving off your leg well, bring him back to a quiet, comfortable walk. Then approach the ditch from a distance at the walk, preparing to ride a line parallel to it but still several feet away. Your goal is to walk as close as you can get to it without having to force the issue—even if that’s 10 feet away—while bending your horse’s head slightly away from it. He will be able to see the ditch out of the corner of his eye, but you will not be showing it to him. Instead, you’re going to prove to him that he can get gradually closer and closer to it without any traumatic negative experiences. As you approach the ditch for the first time, be sure to have your horse’s body parallel to it before you are about two horse lengths away. Using your normal leg aids to ask him to continue walking straight forward, use a single rein to gently turn his head 5 or 6 inches in the direction away from the ditch. Don’t overthink this bending component of the exercise. Simply turn his head to the side while allowing his energy to continue going forward. Resist the urge to kick or squeeze your legs dramatically. That would make your horse feel threatened and would numb him to your aids, which is exactly what we’re trying to avoid. You should still be far enough away from the ditch that he can walk peacefully along without a struggle. After you’ve walked past the ditch, turn your horse away from it. Then make a large circle in the other direction, giving yourself plenty of room to approach the far side of the ditch in the same manner as you did before. (See diagram, at left.) As you maneuver to that side of the ditch, be very careful to never turn your horse to face it directly. Walk past the back side of the ditch, again riding parallel to it at a comfortable distance while turning his head slightly away from it. So, for example, if the ditch is on your left side on the first approach, turn to the right after you’re past it. 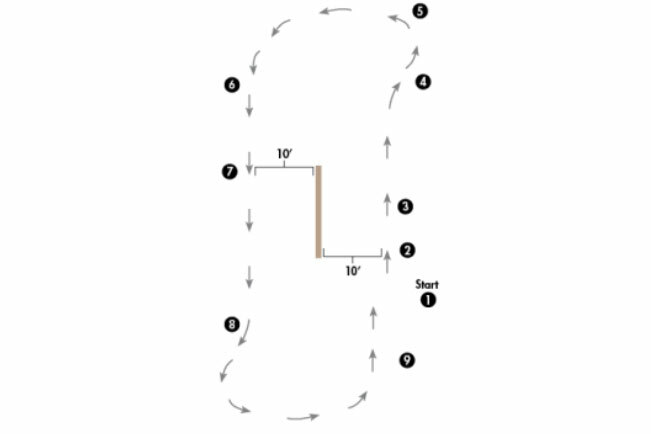 Then make a large circle to the left and walk past the other side of the ditch, which will still be on your horse’s left side. Repeat this process several times, gradually moving your parallel lines closer and closer to the ditch until you’re within 2 or 3 feet of it. As you do so, remember that it’s your job to determine the line you travel. This exercise should never get so difficult that you have to ride aggressively, but you must still make it understood that your horse needs to stay focused on you at all times. You’ll be surprised how easily you’ll get him close to the ditch with this method. Because you do it so peacefully, he will learn that he can put his feet near the ditch safely without worrying that he’ll be bullied into doing something he doesn’t feel ready to do yet. Getting him this close to the ditch is a huge step psychologically. It shows him that the ground where he’s going to take off from when you finally ask him to jump the ditch is stable. Now you’ll have a far greater chance of getting him to the other side of the ditch than you would have had if you’d galloped head-on toward it and risked having him stop a stride and a half away. But you’re not going to try to jump the ditch yet. 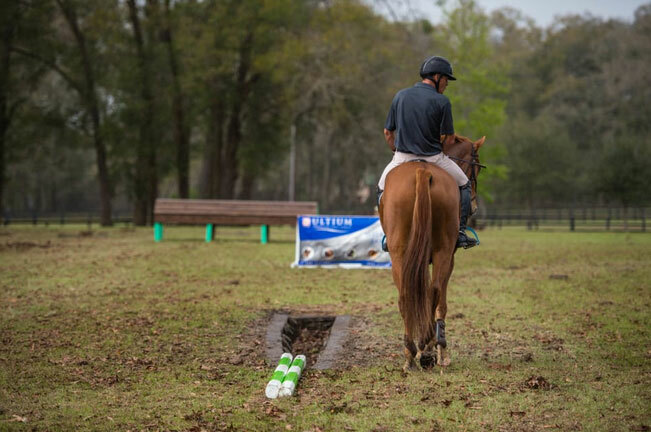 Repeat the entire process in the opposite direction so your horse is passing the ditch on the other side of his body. If you started with it on his left side, as described in the example, this time start with it on his right side. When he is quietly walking along its edge in both directions, you’re ready to move on to the next step. Stay tuned for Part 2 of our series on mastering ditches! Choose a simple ditch with enough space around it for maneuvering. Approach the ditch from a distance at the walk, preparing to ride a line parallel to it but still several feet away. 1. Start with a quiet, comfortable walk with horse’s body parallel the ditch. 2. Turn horse’s head to the right 5–6 inches. 3. Make sure horse’s body is parallel to the ditch. 5. Make a large left turn and circle back to the ditch. 6. Walk back toward the ditch with horse’s body parallel to it. 7. Turn horse’s head to the right 5–6 inches. 8. Turn right, make a large left turn and circle back to the ditch. 9. Repeat several times, gradually moving the parallel line closer to the ditch until you’re within 2 or 3 feet of it. Marshall already has some experience with ditches, so I can begin fairly close to the edge of this one. Many horses need to start much farther away—even 10 feet away—then gradually work their way in to this point. That’s fine—there’s no rush! As we approach the ditch, I close my right leg and open my right rein to ask him to bend his head and neck 5 or 6 inches to the right so he’s looking away from the ditch. After passing the ditch, I turn him to the right and then make a wide, looping turn left back toward it. I’ve raised my heel too high here, but I’m clearly using my legs to keep him marching forward. As we approach the ditch on the other side, I bend his head and neck to the right again so he never gets a chance to look directly at the ditch. After passing the ditch, I turn him to the right and then make a wide turn left back toward it. I repeat this process several times, gradually moving my parallel line closer and closer to the ditch until I’m within 2 or 3 feet of it. Notice how Marshall walks right past the ditch, maintaining a calm, peaceful attitude. This is the result of my methodical process of working incrementally closer and closer to the ditch so he trusts me and knows the ground around it is safe. Canadian native Kyle Carter spent his Junior years show jumping at Spruce Meadows. He switched gears to three-day eventing when he turned 18 and spent a year training in England. Since then, Kyle has represented Canada multiple times, including the 2007 Pan American Games, in which he finished fifth individually and won the team silver medal, the 2008 Hong Kong Olympics and the 2010 World Equestrian Games, where he earned another team silver medal. Kyle also placed second in the Rolex Kentucky Three-Day Event CCI*** in 1999. 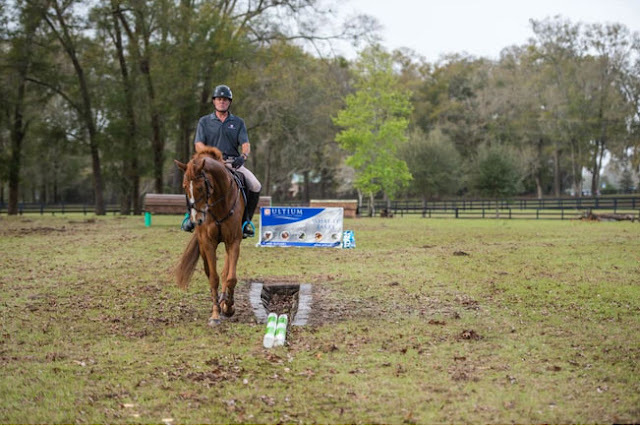 Well known for his teaching acumen, Kyle is a Level IV instructor through the U.S. Eventing Association’s Instructor Certification Program and a Level III coach in Canada. His students have earned numerous top awards, including the USEA Intermediate Amateur High Point award, the Preliminary Amateur High Point award and the Markham Trophy (for the highest-placed Young Rider at a CCI*** championship). He has coached the Area III North American Junior and Young Rider Championships team to many medals. Kyle has also coached both the Guatemalan and Venezuelan national event teams. He and his wife, Jennifer, own and operate Five Ring Stable in Ocala, Florida. Kyle thanks his sponsors for their support: CWD, Purina, English Riding Supply, Romfh, One K Helmets, Veredus, Deniro Boot Co., Heritage Gloves, Omega Alpha Equine and Actistatin Equine.